With Labor Day Weekend inching ever closer, it’s time for us to officially, though reluctantly, say goodbye to summer, and welcome the fast-approaching fall season. The dramatic hills and bluffs surrounding Center City are already showing hints of their colorful autumnal hues, which means now is the perfect time to plan a getaway to our Minnesota Bed and Breakfast. As the air begins to cool, we’ll soon be surrounded by fall’s hallmark hues of crimson, orange, yellow, and green. You won’t have to go far to see the finest fall foliage the Midwest has to offer. We have a few great ideas to make this fall foliage season one you’ll never forget. But first, you need to book your room at our romantic Minnesota Bed and Breakfast. Rooms will fill up fast during peak fall foliage season, so don’t wait! The fall color show in Minnesota is nothing short of spectacular. The peak of fall foliage season typically stretches from early-September through mid-October, but can vary depending on the weather. 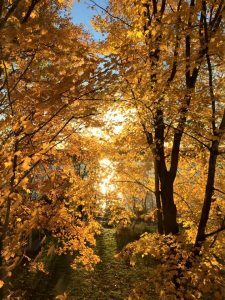 The best way to get those panoramic fall views we’re all after is by taking a hike or a scenic cruise along the St. Croix River, but those certainly are not your only options. There are a full range of fall-themed activities to enjoy in the Chisago Lakes Area, and we’ve highlighted a few of our favorites for you below. Take a fall color cruise along the St. Croix River. Wander through the fall beauty at Panola Valley Gardens. Visit local vineyards, and help them celebrate the harvest season. Go Apple picking in local orchards, such as Pleasant Valley Orchard. Don’t forget to visit their gift shop for a delectable range of treats. Take a scenic drive through the picturesque countryside. Paddle down the Chisago Lakes Water Trail, and take in the fall colors from a unique vantage point. Take a hike at the incredibly scenic Wild River State Park or Interstate Park, both of which have miles upon miles of incredible hiking and recreation trails. We’ve already begun decorating the Summit Inn for the season, and there are delicious fall treats coming out of our kitchen as well. Beyond relishing the gorgeous hues of fall, there’s plenty to do around the Chisago Lakes Area. Book your stay with us today, and start planning your fall getaway to our Minnesota Bed and Breakfast.